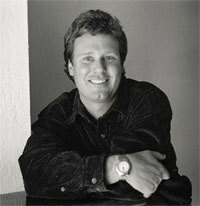 Richard Carlson (May 16, 1961 – December 13, 2006) was an American author, psychotherapist, and motivational speaker. His book, Don’t Sweat the Small Stuff... and it’s all Small Stuff (1997), was USA Today's bestselling book for two consecutive years. and spent over 101 weeks on the New York Times Best Seller list. It was published in 135 countries and translated into Latvian, Polish, Icelandic, Serbian and 26 other languages. Carlson went on to write 20 books. Carlson was born and raised in Piedmont, California in East San Francisco Bay Area. He played tennis and was the top ranked junior in Northern California in 1979. He received his bachelor's degree from Pepperdine University in Malibu, California, where he met and married Kristine Anderson (Kris Carlson) in 1981. Carlson started his career as a psychotherapist and ran a stress management centre. He published his first book in 1985, but became famous with his 10th book, Don’t Sweat the Small Stuff…and it’s all Small Stuff. While Richard Carlson did not coin the term "Don't Sweat the Small Stuff," he was awarded a trademark for bringing it into American pop culture. The book was number one on the New York Times list for over 100 weeks. The Don't Sweat series is based on his earlier work presented in "You Can Be Happy, No Matter What: Five Principles to Keep Life in Perspective." People magazine named Richard Carlson as one of that publication's "Most Intriguing People in the World." He was popular on the talk-show circuit. Meanwhile, he also appeared in a Don't Sweat the Small Stuff... and It's All Small Stuff TV special, and soon took up writing full-time. His following books include Slowing Down to the Speed of Life (co-authored with Joe Bailey, 1997), one co-authored by his wife, Don't Sweat The Small Stuff in Love (2000), and What About the Big Stuff (2002). You Can Feel Good Again: Common-Sense Therapy for Releasing Depression and Changing Your Life, Published by Penguin Group (USA) Incorporated, 1994. ISBN 0-452-27242-4. Handbook for the Soul (with Benjamin Shield), Boston: Little, Brown, 1995. Shortcut Through Therapy: ten principles of growth-oriented, contented living, Published by Plume, 1995. ISBN 978-0-452-27383-2. Don't Sweat the Small Stuff—and It's All Small Stuff: Simple Ways to Keep the Little Things from Taking Over Your Life. Published by Hyperion, 1997. ISBN 0-7868-8185-2. You Can Be Happy No Matter What: Five Principles Your Therapist Never Told You, Contributor Dr. Wayne Dyer. Published by New World Library, 1997. ISBN 1-57731-064-0. Don't Worry, Make Money, Published by Hyperion, 1997. ISBN 0-7868-6321-8. Slowing Down to the Speed of Life: How to Create a More Peaceful, Simpler Life from the Inside Out, with Joseph Bailey. Published by Harper Collins, 1998. ISBN 0-06-251454-7. Don't Sweat the Small Stuff with Your Family: Simple Ways to Keep Daily Responsibilities and Household Chaos from Taking Over Your Life, Published by Hyperion, 1998. ISBN 0-7868-8337-5. A Don't Sweat the Small Stuff Treasury: A Special Selection for Teachers, Published by Hyperion, 1999. ISBN 0-7868-6576-8. Don't Sweat the Small Stuff Teens: Simple Ways to Keep Your Cool in Stressful Times, Published by Tandem Library, 2000. ISBN 0-613-31135-3. Don't Sweat the Small Stuff in Love: Simple Ways to Nurture and Strengthen Your Relationships While Avoiding the Habits That Break Down Your Loving Connection, with Kristine Carlson. Published by Hyperion Books, 2000. ISBN 0-7868-8420-7. The Don't Sweat Guide for Parents: Reduce Stress and Enjoy Your Kids More, Don't Sweat Press, Publisher, Don't Sweat Press, Published by Hyperion, 2001. ISBN 0-7868-8718-4. Don't Sweat the Small Stuff for Men: Simple Ways to Minimize Stress in a Competitive World, Published by Hyperion, 2001. ISBN 0-7868-8636-6. Don't Sweat the Small Stuff for Women: Simple and Practical Ways to Do What Matters Most and Find Time for You, with Kristine Carlson, Published by Hyperion, 2001, ISBN 0-7868-8602-1. The Don't Sweat Guide for Moms: Being More Relaxed and Peaceful So Your Kids Are, Too, with Don't Sweat Press, Kristine Carlson. Published by Hyperion, 2002. ISBN 0-7868-8727-3. The Don't Sweat Guide for Graduates: Facing New Challenges with Confidence, Don't Sweat Press. Published by Hyperion, 2002. ISBN 0-7868-8725-7. What About the Big Stuff? : Finding Strength and Moving Forward When the Stakes Are High. Published by Hyperion Books, 2003. ISBN 0-7868-8880-6. The Don't Sweat Guide for Teachers: Cutting Through the Clutter So That Every Day Counts, Don't Sweat Press, Published by Hyperion, 2003. ISBN 0-7868-9053-3. The Don't Sweat Guide for Dads: Stopping Stress from Getting in the Way of What Really Matters, Published by Hyperion, 2003. ISBN 0-7868-8724-9. The Don't Sweat Guide to Your Job Search: Finding a Career You Really Love, by Editors of Don't Sweat Press, Richard Carlson, Published by Hyperion, 2004. ISBN 1-4013-0760-4. Don't Get Scrooged: How to Thrive in a World Full of Obnoxious, Incompetent, Arrogant, and Downright Mean-spirited People, Published by HarperCollins, 2006. ISBN 0-06-075892-9. You Can Be Happy No Matter What: Five Principles for Keeping Life in Perspective, Contributor Dr. Wayne Dyer. Published by New World Library, 2006. ISBN 1-57731-568-5. An Hour to Live, an Hour to Love: The True Story of the Best Gift Ever Given, with Kristine Carlson. Hyperion 2007. ISBN 1-4013-2257-3. Focus on the Good Stuff: The Power of Appreciation, by Mike Robbins, Richard Carlson. Published by Wiley Default, 2007. ISBN 0-7879-8879-0. ^ a b Richard Carlson: Bestselling self-help guru The Independent, December 30, 2006. ^ Obituary - Richard Carlson The Telegraph, Jan 4, 2007. ^ 'Don't Sweat Small Stuff' author Carlson dies at 45 The Oakland Tribune, Dec 15, 2006. ^ Carlson's advice in huge demand San Francisco Chronicle, Jerry Carroll, Chronicle Staff Writer, February 17, 1998. ^ 'Don't Sweat Small Stuff' author dies at 45 San Francisco Chronicle December 16, 2006. This page was last edited on 16 August 2018, at 15:34 (UTC).